Open the can of biscuit dough. Place biscuit dough pieces on a floured cutting board. Roll out each piece of biscuit dough to a flat circle-approximately 5 inches in diameter. Remove the pop-up timer and replace it on top of the fillet. 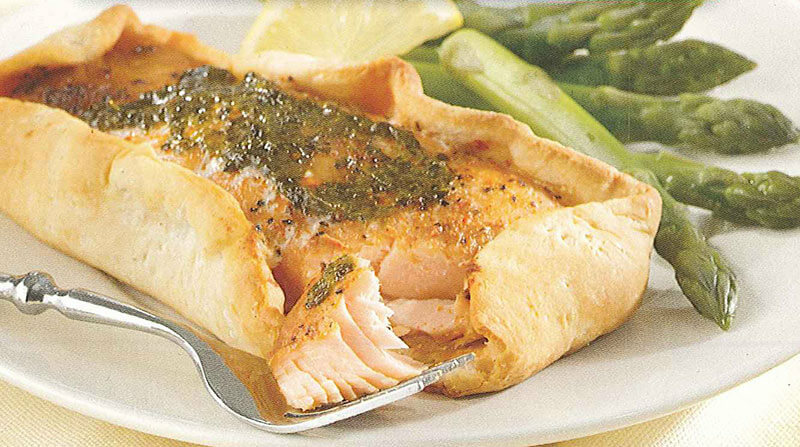 Fold the edges of the dough around the salmon leaving the center of the salmon exposed. Top each salmon fillet with 1 teaspoon of basil paste. If preparing fewer servings, make the extra biscuits and serve on the side.